Harris Stevens, top center, changed his major from pre-med to marine biology after a trip to the Dauphin Island Sea Lab with Dr. Lee Stanton. Harris Stevens was nearing the end of his pre-med bachelor's degree at the University of West Alabama when he took a trip with Dr. Lee Stanton to the Dauphin Island Sea Lab this past April. Dr. Stanton brought his spring ecology class to Dauphin Island to explore the island's ecosystems. During the trip, the class seined at the beach, toured the Estuarium, took a trip to Port aux Pins, and explored Mobile Bay aboard the R/V Alabama Discovery. "It was my first time on the DISL campus and seeing everything was very interesting," Stevens said. "I liked the idea of being able to see what I was working with as opposed to being in a classroom." So, Stevens chatted with Dr. Stanton after the trip about making a switch from pre-med to marine biology. "I decided to make the change in my major, because I realized how much I enjoy learning about ecology and how different ecosystems function," Stevens explained. 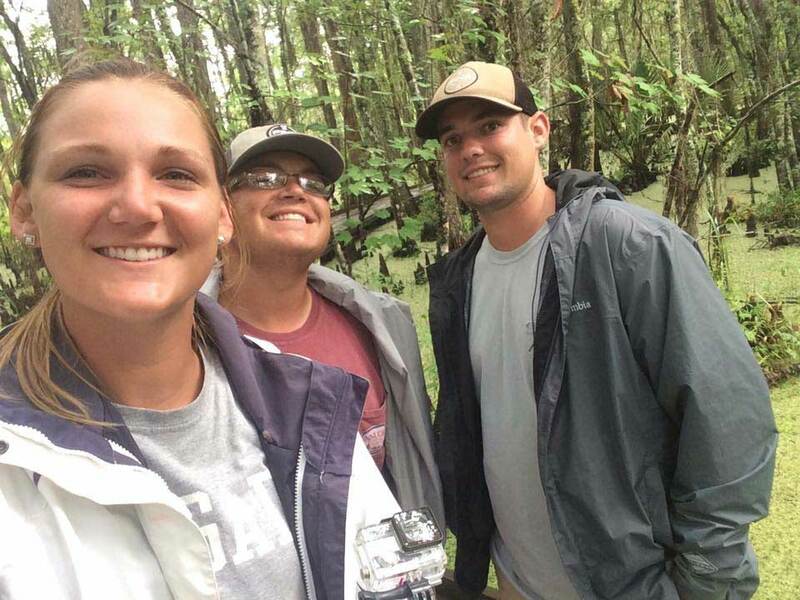 Erin Council, Brannon O'Pry, and Harris Stevens snap a photo during a trip to the field with the Coastal Wetlands Ecology class taught by Dr. Lee Stanton at the Dauphin Island Sea Lab during University Programs summer session. With Dr. Stanton's help, Stevens made the switch, and signed up for a full summer semester with DISL's University Programs. His course load includes the Ecology of the Everglades, Coastal Wetlands Ecology, Marine Botany, Coastal Birds of Alabama, and Marine Invertebrate Zoology. Stevens has enjoyed the experience of being in the field to see how the concepts learned in class are illustrated. "The emphasis on being in the field makes a tremendous difference," Stevens elaborated. "I feel that the classroom is a very important aspect of learning, but getting out and seeing these concepts out in nature and how they are applied are invaluable." 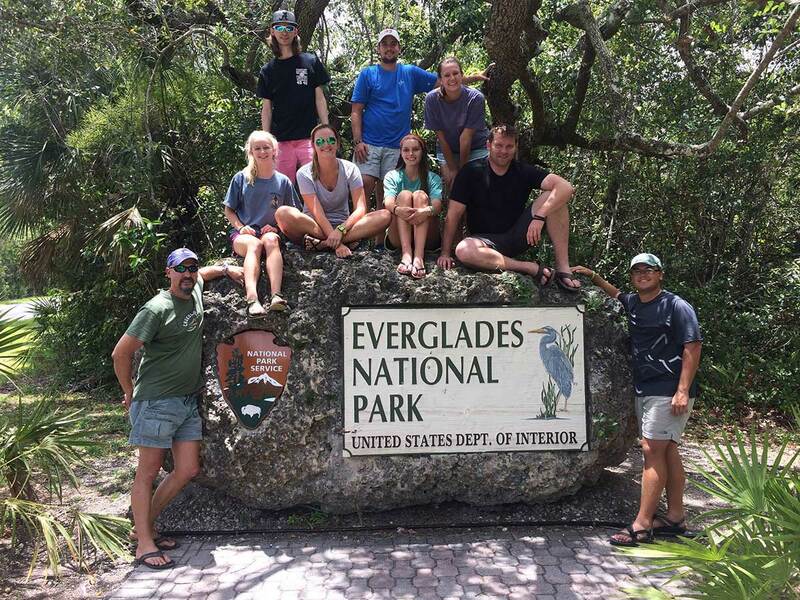 Stevens most memorable moment so far this summer has been the trip to the Florida Everglades, particularly kayaking through a red mangrove forest. "It was incredible to see the dense network of prop roots and narrow passages within them," Stevens said. The Montgomery, Alabama native plans to graduate in the fall with a degree in marine biology, and then pursue higher degrees in the field of marine sciences or conservation.